While most of us were counting sheep in the wonderful world of dream land I was going through my list of people that I was blessed with having a mentoring relationship with. It caused me to reflect on what the characteristics of a good mentoring relationship would be and was I bringing value to the mentoring relationships that I had. The link below provides us with some food for thought on what the characteristics of a good mentoring relationship can be. Let me share my thoughts! For me it is all about building a trusted relationship. A two way trusted relationship that is focused on personal and professional growth. 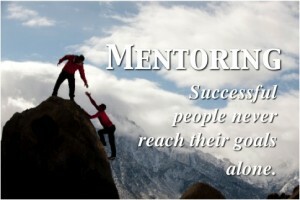 Great mentors know that they too will learn and grow from this relationship and are open and flexible to do so. There hasn’t been a time yet that I came away from a mentoring session where I did not learn something about myself. One of the most important things that we talk about is the ability for a great mentor to create that safe environment for a conversation to take place. I frequently hear some of the people that I spend time with in a mentoring relationship comment that they feel safe sharing their experiences with me. I have created for them a safe place complete with trust so we can begin the learning and development journey. Learning is a very broad term as it can encompass a number of things. For me learning about self is one of the priorities. A great mentor is one who is comfortable taking on the personal growth challenges that we all face. What I have seen with a lot of the people that I spend time with is that there are those personal challenges that if not addressed move from being an issue to becoming a problem. Part of the mentoring process is to identifying potential issues that need to be addressed quickly in order to prevent them from becoming a problem. Once an issue becomes a problem it will impact a larger audience. Relationships require work – they require care and feeding in order to grow. They do not happen overnight and take time. I have seen instances with some mentor programs where the requirement is to meet once a month. I highly recommend a more frequent meeting schedule at least during the initial stages of the relationship. It is very difficult to build trust when you are only meeting once a month. You want to make sure that there is chemistry there otherwise you will not be as successful as you could. I am mentoring some people remotely as they are in a different part of the world. We have scheduled weekly meetings and we both seem to get value from that. We know that we need to have that structure in order for us to further our relationship and to stay focused on the tasks we need to get done. The mentoring relationship and the “gift of mentoring” is truly a gift from the universe. Embrace the opportunity to develop a meaningful relationship with your mentor. Together you can go on an incredible journey that will see you grow personally and professionally.